Comprehensive Sleep Care Center is the ONLY sleep health center in the Washington, DC metro area to offer full medical insurance coverage for the treatment of mild to moderate sleep apnea with oral appliance therapy. Other sleep centers require patients to visit a dentist not associated with the clinic. Although most insurance companies will cover the cost of oral appliances, patients at most other sleep clinics must pay the entire cost of the oral appliance up front, then wait for insurance reimbursement. At Comprehensive Sleep Care Center, we will bill your insurance directly for the oral appliance. We also provide a discounted rate and flexible payment plan option through Care Credit for those without health insurance. Some patients with mild to moderate sleep apnea benefit from wearing an oral appliance while they sleep. An oral appliance is just an acrylic device that fits over upper and lower teeth, almost like a set of retainers. 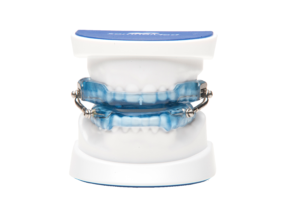 Sleep apnea oral appliances have been in use for over fifteen years, and have been well received by our patients. At Comprehensive Sleep Care Center, we are unique, in that we are the only sleep health center in the DC metro area with a team of dentists on our staff to make it a fast, easy, and cost-effective process for an oral appliance. Pretty serious stuff if left untreated. There may be solutions available that comfortably fit your lifestyle through a simple visit to our in-house board-certified dentist. Our Comprehensive Sleep Care Center dental specialist will work with our board-certified sleep medicine physicians to determine if our customized oral, dental appliance therapy is appropriate for your condition. Our billing specialists will verify your health insurance benefits to determine coverage for an oral appliance option, and we will bill your health insurance company directly – subject to your plan’s co-pay and any deductible. Oral appliance therapy (OAT) is a non-invasive alternative to CPAP, for snoring and obstructive sleep apnea treatment. It is accepted and recommended by the American Academy of Sleep Medicine (AASM) as a treatment for mild to moderate obstructive sleep apnea, and in cases where patients are unable to tolerate CPAP therapy. Our oral appliances are FDA approved, non-invasive, adjustable and portable. Oral appliances are similar in appearance to mouth guards or retainers and are worn only while you sleep. The appliances are custom fit and work by moving the lower jaw slightly forward to keep the airway open during sleep. They also keep the soft tissue in the mouth from collapsing and obstructing breathing. They are small, comfortable, silent, and easy to carry when traveling. An oral appliance must be custom-made to precisely fit in a patient’s mouth in order to achieve a good therapeutic effect. It will take several nights of wearing the device before you grow accustomed to it. Over time, most patients tolerate their device very well and experience significant improvements in snoring and sleep apnea symptoms.